This medical malpractice claim was filed in Prince George's County after excessive fluid accumulation complicated a woman's liposuction recovery. It was filed in Health Claims Arbitration on January 29, 2018, and it is the 54th medical malpractice case filed in Maryland this year. A woman presented to a physician at Heron Smart Lipo Center (Heron Med Spa) for an evaluation and a liposuction procedure. During her first postoperative visit several days after the procedure, the woman reported feeling miserable and nauseated. The physician noticed that all four of her abdominal and arm incisions were draining and her left inner thigh incision was open. The doctor prescribed medications including Cipro, Vicodin, and Lasix and additionally recommended that she use ice and massage. Two weeks after her liposuction, the woman joined the weight loss clinic at Doctor's Weight Loss Centers. While at the clinic she used the restroom frequently because her incision sites were open and draining. That same day, the woman was taken to the emergency room at MedStar Southern Maryland Hospital Center with complaints of sharp, stabbing abdominal pain. She underwent a CT scan showing significant inflammation and cellulitis in her abdomen with areas of fluid collection wrapping around her abdominal wall. A general surgeon at the hospital performed a physical exam and noted that five out of the fifteen incisions from the woman's liposuction surgery were open and draining serosanguinous fluid (yellow with small amounts of blood). There were too many fluid collections to attempt a drainage procedure, so the surgeon consulted with an interventional radiologist to see if any of the fluid collections could be aspirated. The woman's white blood cell count elevated and she was prescribed IV Aztreonam and an increase in the Vancomycin dose she had been receiving to treat the cellulitis. Cultures from her right upper abdominal abscess were positive for coagulase positive staphylococcus, a type of staph infection that produces an enzyme causing blood clot formation. Interventional radiology drained fluid from her right and left abdominal quadrants. No plastic surgeons were available at the Southern Maryland hospital, so the woman was transferred to MedStar Washington Hospital Center. There, she underwent a series of debridement procedures for her abdominal and right thigh abscesses. After spending nearly a month in the hospital, the woman was discharged home and followed as an outpatient by a wound physician, a trauma physician, and a plastic surgeon. She later had a 40 x 15-centimeter area of scar tissue removed and underwent a complex closure for nine additional centimeters of scar tissue. According to the American Society of Plastic Surgeons, fluid accumulation is a known risk of liposuction. To a certain extent, fluid collection and swelling are normal after a liposuction because the body needs to fill the empty space where the fat used to be. Physicians typically recommend a compression garment, massage, and exercise following a liposuction to help mitigate the swelling. Since compression wear is the most highly recommended postoperative fluid reduction technique, it is concerning that a compression garment was not mentioned anywhere in this woman's statement. Typically, post-liposuction fluid accumulation is soft and mildly tender without significant pain or signs of inflammation. When fluid accumulation is accompanied by unusual pain and discomfort persisting beyond six weeks, the patient may have suffered excessive tissue trauma caused by aggressive over-suctioning. This type of injury can cause a longer recovery time, increased scaring, fibrosis, and surface contour irregularities. Failing to properly monitor, diagnose, and treat the claimant's medical condition. Failing to perform an appropriate liposuction surgery on the claimant. 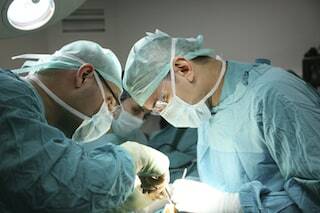 As a direct result of the defendant health care providers' negligence, the claimant suffered serious and permanent personal injuries, inconvenience, discomfort, disfigurement, pain, and loss of earnings. View sample settlements and verdicts from Prince George's County. Learn more about cosmetic surgery malpractice and infection lawsuits. Read about a different liposuction malpractice lawsuit in Anne Arundel County.